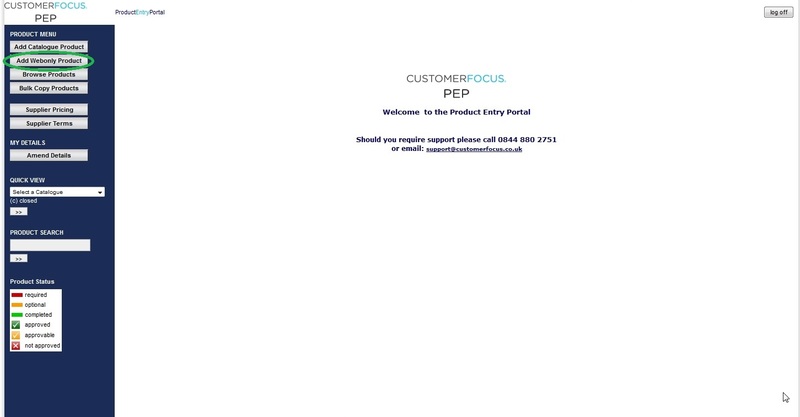 This is the login screen of the Product Entry Portal, located here. 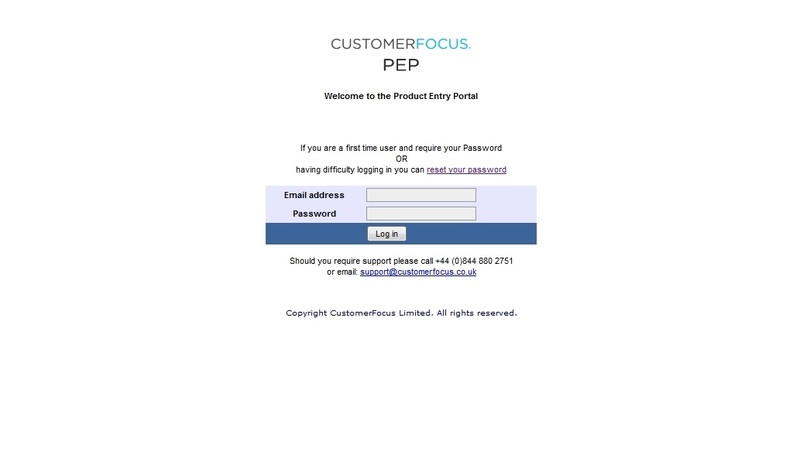 Enter your Customer Focus login details and click Log in. You will be taken to the PEP home page. On the left side you can see the available options. To add a new product to Customer Focus Search, select Add Webonly Product from the menu. Customer Focus Search uses a points scoring system to evaluate which products appear higher in search results. The more information entered for a product leads to a higher score and thus a better ranking on searches. To maximise the potential of listings, it is in the interests of the supplier to include as much data as they can. For more information on how the points system works and how to make the most of it, please visit this page here. To create a product, firstly a Title needs to be entered. 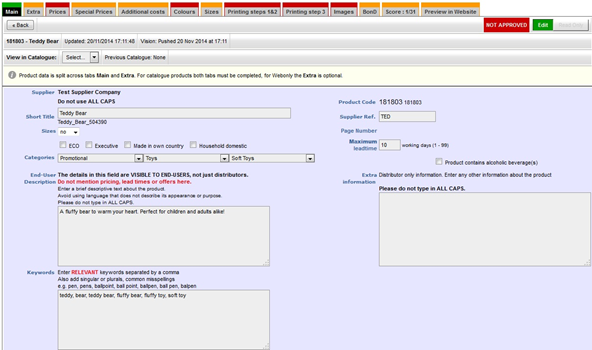 Then select which Catalogue it is to be entered in (in this case Webonly). Then, select the category that is most closely associated to your product. You can either select from the dropdown box, or type a category you think best suits. This will highlight a category with the entered words if it exists on the system. 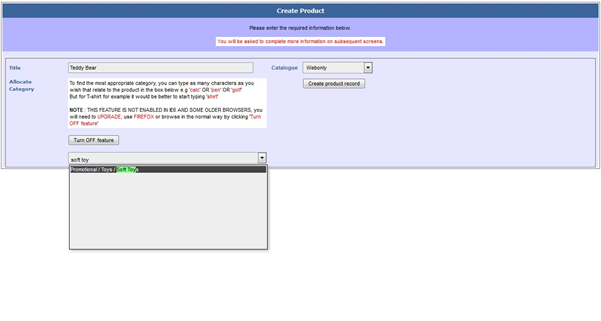 Then click the Create product record button. This is the main information page for your product. Firstly, check that the page is set to Edit mode, as opposed to Read Only. This is located in the upper right of the page. The “Edit” button should be highlighted in green. Please check this on each tab you visit thereafter. Red: This page is missing key information. The product cannot be approved as long as this remains red and the information missing must be completed. Orange: Not all information is complete, but what is missing is optional and will not affect approval of the product. Green: The product information is complete. Supplier Ref: Enter the product reference in the top right. This is a reference you have for the product to identify it. Sizes: Only select yes from the dropdown if your product is clothing and comes in varying size ranges. Otherwise leave this as no. Maximum leadtime: Enter the maximum lead time in working days for the product. This will add 1 point to your product score. End-User Description: Enter the description of the product you want visible to end-users, not just distributors. Do not mention any terms such as prices, lead times and offers. Keywords: Enter any common keywords and search terms that are related to your product. The more information placed in these sections, the higher chance you will have of attracting a distributor’s attention. Extra Information: If you would like to enter any additional information visible to the distributor only. Please enter it in this section. Remember to Save using the button located at the bottom. Commodity Code: Enter a commodity code for your product if you have one. Commodity codes are what determines import taxation classification. They denote what sector a product belongs to. You can search a list of them at the following address. https://www.gov.uk/trade-tariff/sections. This will add 1 point to your product score. Other Lead Times: If the product has any alternative lead times that differ from the one you entered on the main tab, you can place them in the section marked, along with any comments to explain. For example, you may want to state orders under 200 units may be completed several days earlier than the maximum lead time as stated on the main page. Print Specification: Print will be covered more in depth in a later section, so this part is not a necessity. Carton Weight: Enter the weight of the carton in kgs if this is applicable. Carton Dimensions: Enter the width, height and/or diameter/depth of the carton in mm. Carton Quantity: Enter the amount included in a carton. This will add 1 point to your product score. Product Weight: Enter the weight of the product in kgs. Product Dimensions: Enter the width, height and/or diameter/depth of the product in mm. This will add 2 points to your product score. Dimensions as Text: Enter the product dimensions as text if you wish to make it clearer on the site for distributors. Country of Origin: Using the dropdown menu, select the country the product was produced, if known. Firstly, enter the quantity break values you wish to have for your product pricing. Enter these in the text box in the top left of the page. After entering each individually, press the create price break button. This will display the quantity entered in the price table. Continue until you have entered all desired quantities. To remove a quantity, click on its number below the text box. This will remove it from the table. Enter your pricing using one column only. DO NOT enter pricing in different columns. This will prevent pricing from displaying correctly on Vision. The prices here should be the standard basic units you offer. So if your product has a Plain Stock price available, enter only those here. If the product is also available with a colour pricing, this should be entered as an Additional Cost, which we shall move on to shortly. If it is offered in 1 Colour, Full Colour etc. as a base, put those prices here instead. Remember to select the mark above the column which you have entered your pricing. If your prices fluctuate constantly, you may want to set your pricing to show as Price On Application. This can be done by checking the mark labelled POA on the left of the table. Remember to save using the ‘update price matrix’ button located underneath the table. This is an optional tab. You can provide special pricing for different combinations of Main Colour, Trim Colour and Size. Default prices will be copied from the normal prices on initial creation, edit these as required. This is where you can accumulate the majority of points for your product. This could be the key difference between getting your products noticed or not. Here you enter any additional costs for the product that are charged on top of the products price. This could include origination, extra print colours, delivery etc. You should focus attention to additional costs that are linked to the print type of your product. For example: If your product is printed in Screen Print, any origination and colour print additional costs should reflect this. Please see this useful lookup table for reference. 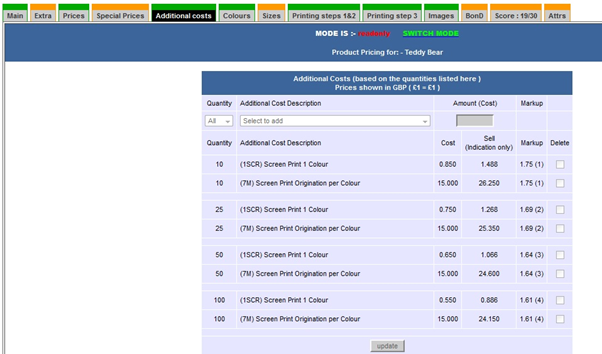 Using the dropdown boxes, choose which quantity break and additional cost you want to add. Then enter the desired price. Press update underneath, and it will appear in the table. There are a maximum of 12 points available for completion of this section. Entering any origination costs will earn the product 7 points. Entering any other additional costs will gain you a further 5 points. From the dropdown menu, select the colour of your product. 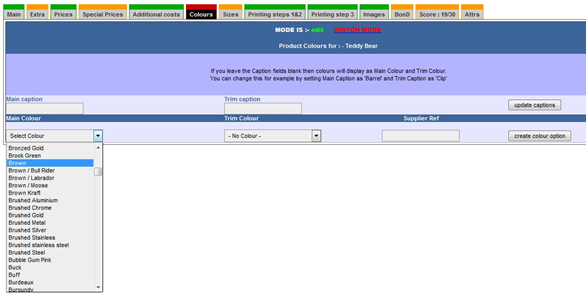 If there is a trim colour for the same item, select this colour in the trim dropdown. Otherwise, leave this blank. Click create colour option on the right, and your chosen colour will be displayed. You can add more by following the same method. This is an optional tab. The options on this page will only become available if the sizes dropdown on the main tab (as noted in step 4) has been marked as ‘yes’. The sizes tab only refers to clothing items. DO NOT enter product dimensions in this section. If you are entering clothing, select the size of the product from the dropdown menu and click add. Repeat this for any further sizes. Here you enter the print types and positions available for your product. 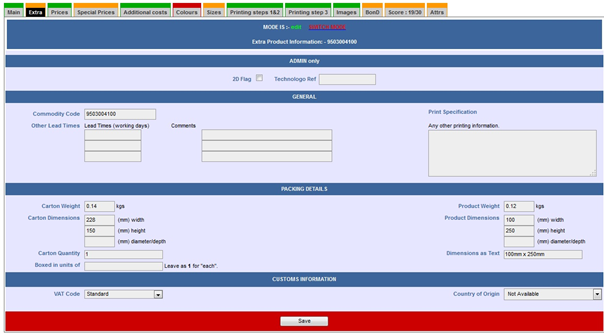 In the section marked ‘STEP 1 : set the print types’, Select the print types used by checking the relevant boxes. Click submit underneath to save these. In the section underneath marked ‘STEP 2 : create the print positions / dimensions’, select the print position using the dropdown box. Then enter the dimensions of the area of print in millimetres in the boxes provided. Click the submit button on the right to save these. Printing Step 3 is confirmation of what you entered on the previous tab. You should see the print position you entered located in a dropdown box. Select this if it is not already and click add option. You will now be presented with the printing details you have entered. Simply tick the box next to the dimensions boxes and click the submit button located on the right. The final step is to upload a product image. A high resolution image will gain you 3 points. A low resolution image may only achieve 1 point. The image should be square and on a white background. A high resolution image is one over 500 x 500 pixels, and a maximum of 2000 x 2000 pixels. Click the browse button, and choose the image you would like to upload. The image will appear underneath. You have now completed the entry of a product. Please check the colour of the tabs at the top for your product. If any are still highlighted in red, then this means there is required data still missing. The product cannot be made live until these sections are complete. When viewing your product from the list of all your products as below. You now want the product to show in orange with a ticked box in the list. This means the product is now ready for approval. Again, if this is red, please check the details of the product.